To eliminate the seasoned Blackhawks in Game 6, the young Ducks must look to veterans, learn from Lightning’s mistakes vs. Rangers. There’s nothing wrong with learning from your own mistakes, but there is a better way. That’s the opportunity that was presented to the Ducks on Tuesday night by the Lightning. Tampa Bay held a 3–2 series lead heading into Game 6 of the Eastern Conference finals against the Rangers, but instead of finishing off New York, the Lightning were overwhelmed by a more experienced opponent. 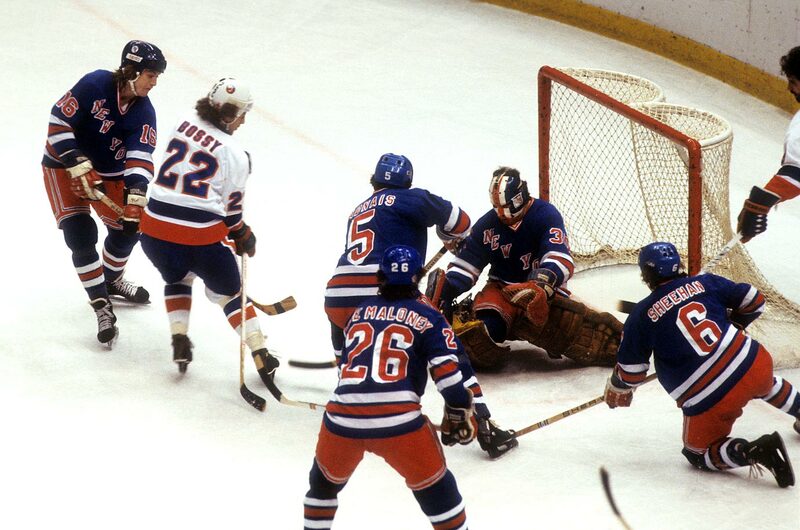 And now, after an ugly 7–3 loss, they face the prospect of a winner-take-all Game 7 at Madison Square Garden, where the Rangers and their goalie have been unbeatable in elimination games. The Game 7 scenario against a tough, resilient foe is one Anaheim hopes to avoid heading into its own Game 6 showdown with the Blackhawks on Wednesday night in Chicago (8 p.m. ET; NBCSN; CBC; TVA). Like the Ducks, Tampa Bay relies heavily on a core of young players. Their inexperience on the big stage may have had something to do with their failure to close out the series against New York. “We've got a young group,” Lightning coach Jon Cooper said after the loss. “They've played some unreal hockey here to get us this far. [But] we showed if we're not going to play the proper way, a really, really good hockey team is going to beat you, and that's what they did. And it’s a lesson that can be used by Anaheim coach Bruce Boudreau as he leads the Ducks into Game 6 against Chicago. Anaheim’s blue-line corps is so young it’s practically a green-line corps. Before this season, five of the Ducks’ six defenseman had skated in 20 playoff games or fewer. Two, Simon Despres and Sami Vatanen, had played fewer than 10. And goaltender Frederik Andersen, who did everything but hand Game 5 to the Hawks, had just seven such games under his belt. Boudreau can’t stick his youngsters in a hothouse and mature them overnight, but he can show them Tampa Bay’s biggest shortcoming—its inability to cash in on chances. Despite the East’s 3–3 series deadlock, it hasn’t been all that close. In fact, the Lightning have been the better team throughout, including the majority of Tuesday night’s blowout loss. Tampa Bay has played with more passion and desperation than the Rangers, and scoring opportunities have been plentiful. But when the Lightning were unable to cash in—a testament to the fine play of goalie Henrik Lundqvist—they sagged. Eventually, the game slipped away from them in the third period. If New York has one advantage over Tampa Bay, it’s mental toughness. The same could be said for Chicago with regard to Anaheim. Ten Blackhawks players have a pair of Stanley Cup rings to go along with five Western Conference finals appearances in the last seven years. Chicago’s core group has done it all, including working its way out of this same spot before. Back in 2013, the Hawks fell behind the Red Wings 3–1 in the conference semifinals before rebounding to take Games 5, 6 and 7 on their way to the 2013 Cup championship. They’ll be ready on Wednesday night. The Ducks’ youngsters will have to match Chicago’s determination. But they won't be going it alone. Unlike the Lightning, Anaheim has an experienced leadership group. Three core players—Ryan Getzlaf, Corey Perry and Francois Beauchemin—won the Stanley Cup in 2007. Both Perry and Getzlaf have also won two Olympic gold medals. And Ryan Kesler’s been around the block as well, with the Canucks’, who went to the Cup finals in 2011. If the kids begin to buckle under the pressure, those four can show them the way. The conference championship can belong to the Ducks ... if they’re up to it. After the Isles, in their first ever playoffs appearance, made history by dumping the Penguins as only the second NHL team to come back from a three games to none deficit, they almost did it to the Flyers. They were shut out twice in dropping the first three games of the Campbell Conference finals and needed OT in Game 4 to avoid being swept. 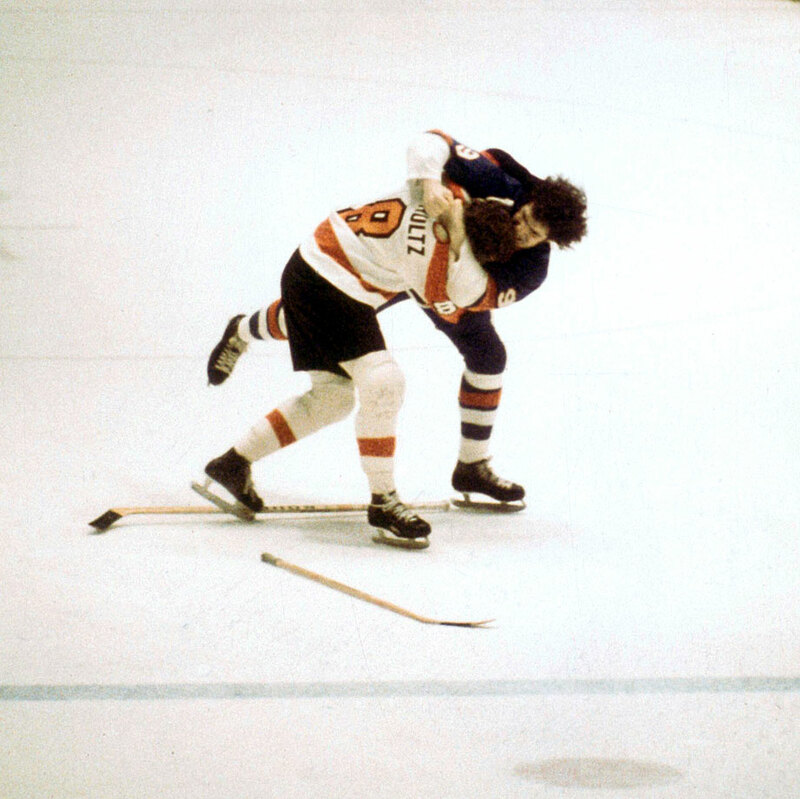 They won the next two, with Clark Gillies famously taking on Philly's infamous enforcer Dave "The Hammer" Schultz, to extend the series and enrich heart specialists in Philly, but the defending Cup champion Flyers were too much in Game 7. Rick MacLeish scored two first-period goals to power a 4-1 victory. The Lightning battled back from deficits of two-games-to-one and three-games-to-two, forcing Game 7 with a rally—Vincent Lecavalier, Martin St. Louis and Brad Richards totaled three goals and eight points—and a gutty defensive effort in a 5-4 win. 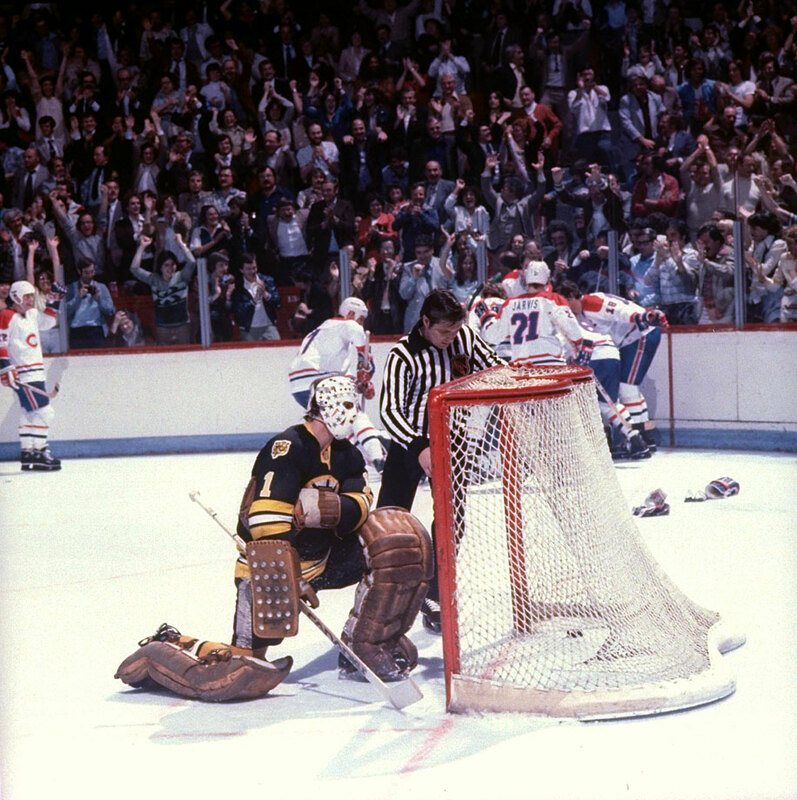 No penalties were called during the finale in Boston as goalies Tim Thomas of the Bruins and Dwayne Roloson of the Lightning dueled save for save. Nathan Horton gave the B’s the 1-0 win by scoring with 7:33 left in the third period. Playing under new post-lockout rules, these two speedy dark horse teams went seven games with five decided by one goal. Momentum swung wildly. Games 5 and 6 went to overtime and Game 7 was forced by Danny Briere’s power play goal in a nail-biting 2-1 win by injury-riddled Buffalo. In the finale, the Hurricanes rallied from a 2-1 deficit as rookie goalie Cam Ward made 22 saves, captain Rod Brind’Amour broke a 2-2 tie by beating Ryan Miller at 11:22 of the third period, and the Carolina hung on to win 4-2 with Jason Williams adding an insurance goal in the final minute. The Red Wings came in as heavy favorites, having won an NHL-record 62 games during the regular season, but it was the second-ranked Avalanche who advanced and went on to win the Cup. 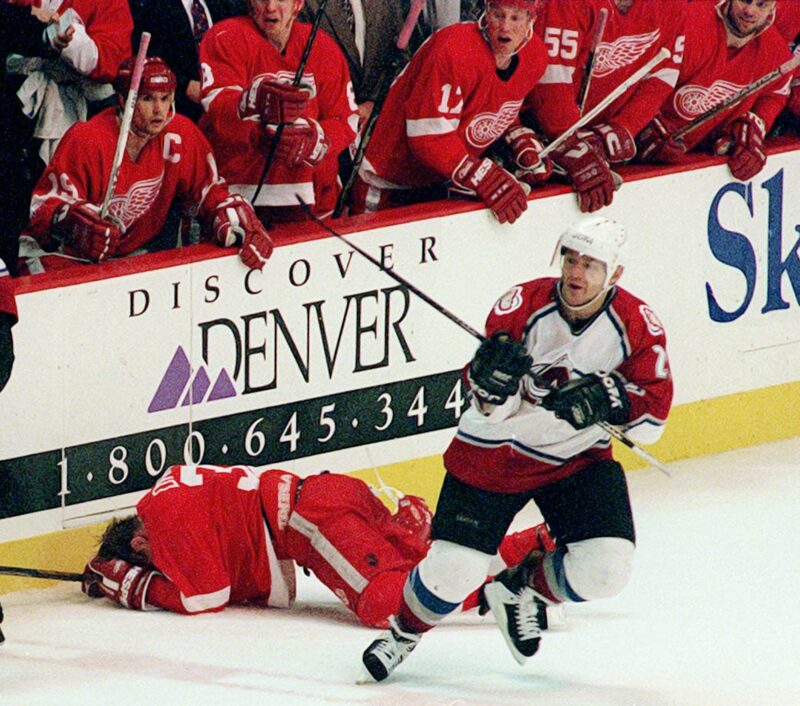 The six-game set was defined by a vicious head shot delivered by Claude Lemieux against Detroit's defenseless Kris Draper in the first period of the finale. Colorado won the game 4-1, but the gruesome injuries suffered by Draper provided the Franz Ferdinand moment that ignited an epic rivalry between the two Western Conference foes. This went only six, but the rivalry's intensity earns it a spot among the all-time greats. The Isles, led by Bryan Trottier and Mike Bossy, were the top regular season team and expected to easily handle their arch-rivals but they twice needed OT to get to Game 5, which the Rangers won, 4-3. In the decisive Game 6, Ron Greschner and Don Murdoch scored 3:42 apart in the second period and goalie John Davidson continued to shine while leading the Rangers to a clinching 2-1 win that handed the Isles a bitter defeat that inspired the birth of their dynasty the next season. Peak Wendel Clark vs. the Great One at his best. The seven games were Old Testament violent, the hockey intense and emotional. Toronto's star forward was a wrecking ball, winning an in an epic tilt with enforcer Marty McSorley in Game 1, then scoring a memorable hat trick in Game 6 that could have clinched the series. 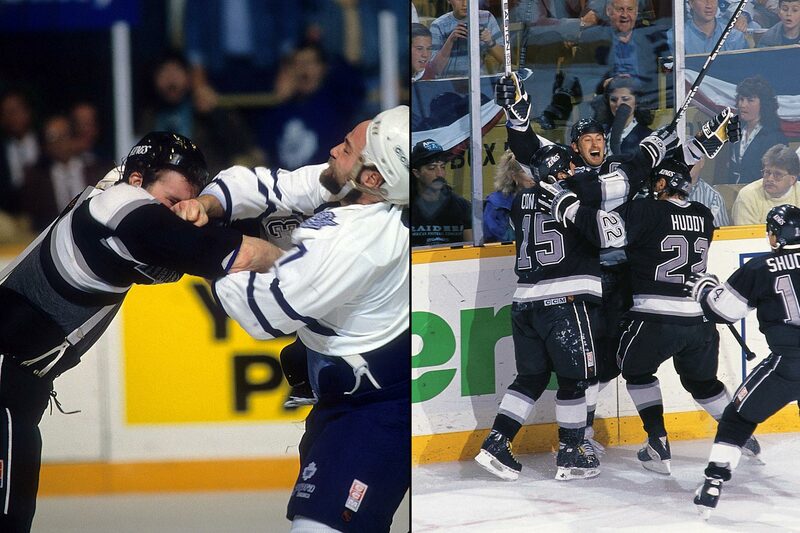 Instead a missed high sticking call on Gretzky gave the Kings life and kept him in the game long enough to score the OT winner, setting up Game 7 in Toronto. Gretzky again rose to the occasion, netting a hatty of his own in L.A.'s 5-4 win. He later called his performance the best of his NHL career. This wasn't so much a series as a resumption of hostilities. Picking up where their bloody regular season war had left off, the Wings and Avs went at each other for six brutal games. Detroit was the better of the two this time around, building up a 3-1 lead highlighted by a 6-0 Game 4 win that saw coaches Marc Crawford and Scotty Bowman almost come to blows between the benches. The Avs stormed back to win Game 5 by an identical 6-0 score but that's where their momentum ended. Sergei Fedorov returned from an injury midway through the game to score the winning goal as Detroit eliminated the champs, 3-1. Mark Messier's legendary vow, an epic goaltending duel between Mike Richter and Martin Brodeur, one of hockey's most enduring calls: “Matteau! Matteau! Matteau!” The Blueshirts and Devils swapped leads early in the series until New Jersey took control with a 4-1 beatdown in Game 5. The loss prompted Messier to famously guarantee a Rangers win in Game 6, one he personally delivered with three goals and four points. 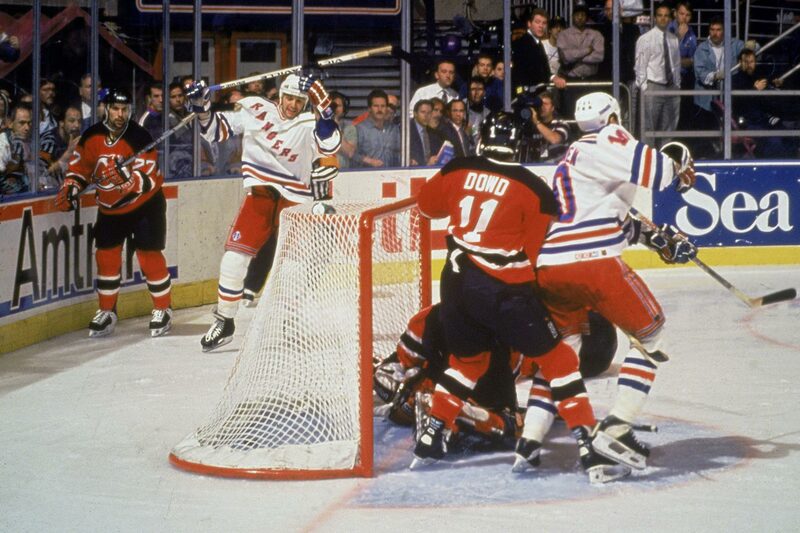 The finale was a tight-checking affair that extended to 2-OT before Stephane Matteau swung out from behind New Jersey’s net and punched New York's ticket to the Cup finals, beating Brodeur on the wraparound. 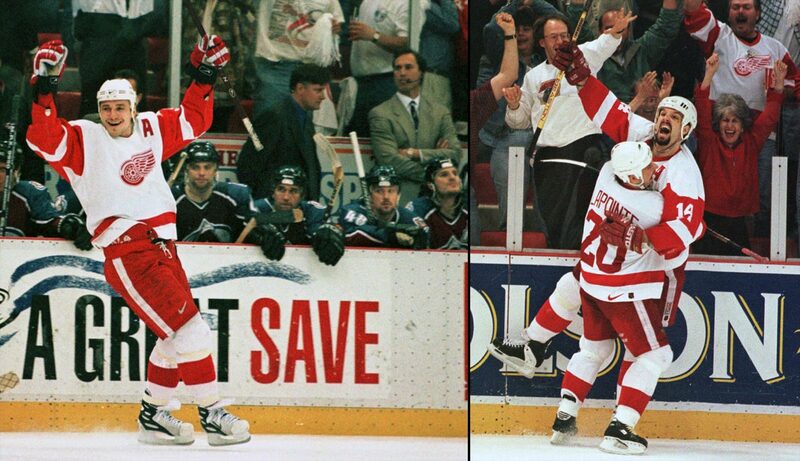 Arguably the greatest series in hockey's greatest rivalry. Montreal had vanquished Boston in the Cup finals the prior two years and was it the height of its Flying Frenchmen glory. The Bruins were immersed in their Lunchpail AC ethic. The home team won the first six games, setting up an unforgettable clincher at the Montreal Forum. The B’s carried a 4-3 lead late into the third and were on the verge of victory when linesman John D'Amico made the most famous call in NHL history: Boston, too many men on the ice. Guy Lafleur tied it on the power play and Yvon Lambert scored the OT winner, sending the Habs on their way to a fourth straight Cup. The rematch of the 2013 West finals featured four one-goal games. Up 3-1 in the series, the Kings rallied to send Game 5 into double OT. 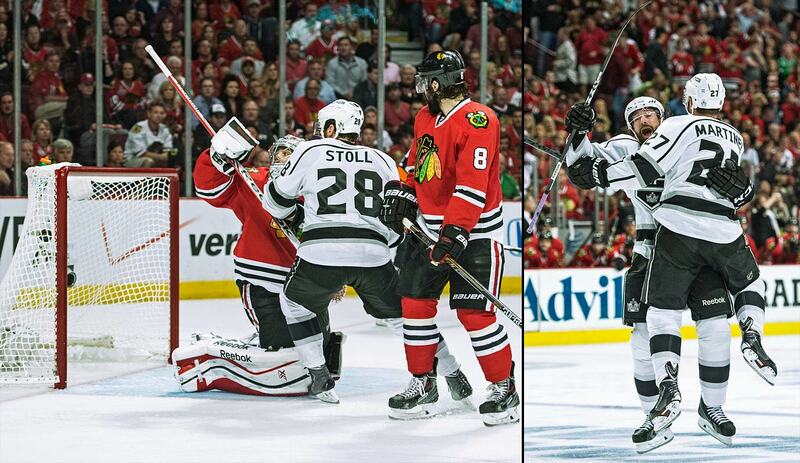 On the brink, the Cup champion Blackhawks were rescued by Michal Handzus at 2:04. In Game 6, the Kings led 3-2, but Patrick Kane, who scored twice, set up the knotter and then netted the winner with 3:45 left in the third period as Chicago prevailed 4-3. Game 7 was a riveting classic in which the Kings came back twice to set up a breathlessly intense OT full of non-stop action that was ended by L.A. defenseman Alec Martinez’s deflected wrist shot from the blue line at the 5:47 mark. • The Blackhawks have yet to lose consecutive games in these playoffs. • Now 15–3 in their last 18 elimination games dating back to 2012, the Rangers have the most such wins by any NHL team in a four-year span. • ​The five goals that New York scored in the third period on Tuesday night were the most in a single playoff frame since 1979, when the Rangers scored six in the third period against the Flyers. The Blueshirts are trying to reach back-to-back Stanley Cup finals for the third time in franchise history, and first since they did so in 1932 and ’33. • Gary Lawless writes that a win tonight could finally earn Anaheim coach Bruce Boudreau the respect that he’s long deserved. • Jeff Blashill’s a little busy with the AHL playoffs right now but he plans to meet with Detroit GM Ken Holland this week to discuss the Red Wings’ coaching vacancy. • The best part of these conference finals is that you never know what you’re going to get.